Beware of mixed technicals as earnings approach for FANG stocks, as Jim Cramer dubbed the Facebook, Amazon, Netflix and Google group. Here’s how to trade earnings volatility. FANG stocks -- as TheStreet's Jim Cramer dubbed the group of tech giants including Facebook (FB - Get Report) , Amazon (AMZN - Get Report) , Netflix (NFLX - Get Report) and Google's Alphabet (GOOGL - Get Report) -- usually have extreme volatility in reaction to earnings reports. Facebook and Google are holdings in Jim Cramer's Action Alerts PLUS Charitable Trust Portfolio. Cramer and Research Director Jack Mohr wrote to Action Alerts PLUS subscribers on Friday that Facebook "continues to fire on all cylinders" as it attracts more users to Instagram and "has so many areas for growth in the core platform." For Google, on the other hand, market "sentiment has soured in recent weeks." Even so, Cramer and Mohr said they "still love the long-term story and do not want to underestimate CFO Ruth Porat and her ability to win over investors." Netflix is scheduled to begin the earnings parade for second-quarter results on July 18, followed by Facebook on July 27, and Alphabet and Amazon on July 28. Amazon's technical setup is the strongest in the group, with a positive but overbought weekly chart. Facebook has a neutral weekly chart but could be positive by the earnings report date. 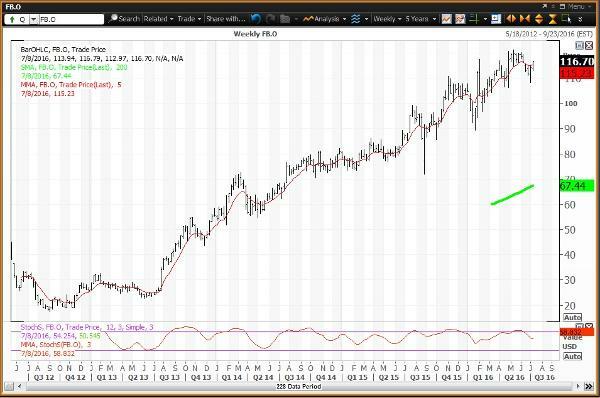 Alphabet has a negative weekly chart that could shift to positive given near term strength. Netflix has a weekly chart that could be positive or negative at this Friday's close. These overall technical setups should result in extreme volatility similar to that which followed first-quarter earnings. Netflix gapped below its 200-day simple moving average on April 19, following a negative reaction to earnings reported on April 18. The stock closed Wednesday at $94.60, down 17.3% year to date. It is in bear market territory, 29% below its all-time high of $133.27, set on Dec. 7, 2015. Alphabet gapped lower at the open on April 22, following a negative reaction to earnings reported on April 21. The stock closed Wednesday at $708.97, down 8.9% year to date. It is in correction territory, 12.5% below its all-time high of $810.35, set on Feb. 2. This stock set its 2016 low of $672.66 on June 27, as markets set their post-Brexit lows. Facebook gapped higher on April 28 on a positive reaction to earnings reported after the closing bell on April 27. 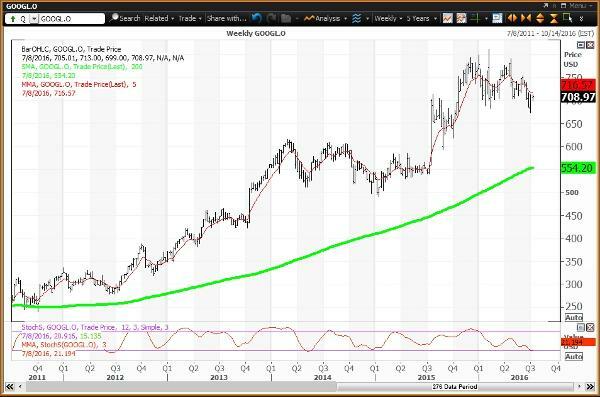 The stock gapped above its 50-day simple moving average, then at $110.41. The stock closed Wednesday at $116.70. It is back above the 50-day, now at $116.41, after trading as low as $108.23 on June 27. The stock filled the gap to its June 10 low of $116.26. Facebook is up 11.5% year to date, the best-performing FANG so far this year. Amazon gapped higher on April 29, following a positive reaction to earnings reported on April 28. The stock closed at $737.61 on Wednesday after setting an all-time high of $737.77. Amazon is up 9.1% year to date, and a whopping 55.6% since trading as low as $474.00 on Feb. 9. 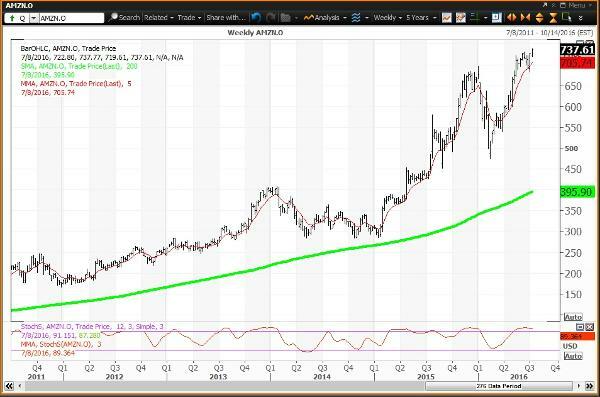 Here's the weekly chart for Amazon. The weekly chart for Amazon is positive but overbought, with the stock above its key weekly moving average of $705.74 and well above the 200-week simple moving average of $395.90. The weekly momentum reading is projected to rise to be 89.36 this week, well above the overbought threshold of 80.00. 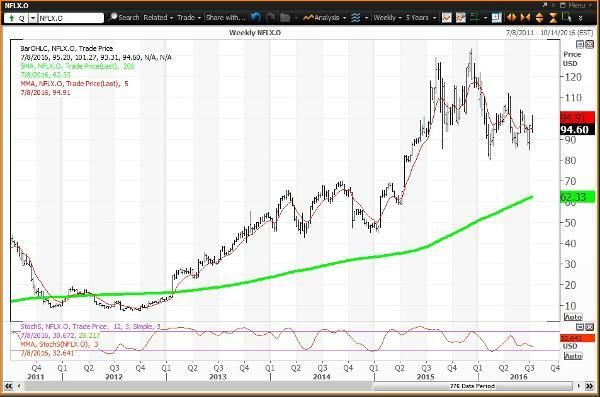 Amazon last tested its 200-week SMA during the week of Feb. 6, 2009, when the average was $55.92. The chart shows characteristics of a parabolic bubble, but the final upside cannot yet be confirmed. Investors looking to buy Amazon should consider doing so on weakness to $708.92, which is a key level on technical charts until the end of September. Investors looking to reduce holdings could have done so on strength to $753.85, which is a key level on technical charts until the end of this week. Here's the weekly chart for Facebook. The weekly chart for Facebook is neutral, with the stock above its key weekly moving average of $115.23 and well above the 200-week simple moving average of $67.44. The weekly momentum reading is projected to slip to 58.83 this week, down from 61.12 on July 1. Investors looking to buy Facebook should consider buying weakness to $112.76, which is a key level on technical charts until the end of this week. Investors looking to reduce holdings should consider selling strength to $117.89, $121.83 and $124.32, which are key levels on technical charts until the end of 2016, the end of July and the end of September, respectively. Here's the weekly chart for Alphabet. The weekly chart for Alphabet is neutral, with the stock below its key weekly moving average of $716.57 and well above the 200-week simple moving average of $554.20. The weekly momentum reading is projected to be flat at 21.19 vs. 21.33 on July 1. The 200-week SMA was last tested during the week of Oct. 7, 2011, when the average was $249.87. Investors looking to buy Alphabet should consider doing so on weakness to $581.64 and $562.02, which are key levels on technical charts until the end of 2016. The $704.25 level should be a magnet through September. Investors looking to reduce holdings should consider selling strength to $739.53, which is a key level on technical charts until the end of July. Here's the weekly chart for Netflix. The weekly chart for Netflix is neutral, with the stock just below its key weekly moving average of $94.91 and well above the 200-week simple moving average of $62.22. The weekly momentum reading is projected to decline to 32.64 this week, vs. 33.63 on July 1. The 200-week SMA was last tested during the week of Jan. 25, 2013, when the average was $15.29. Investors looking to buy Netflix should consider doing so on weakness to $91.79 and $82.98, which are key levels on technical charts until the end of July and the end of 2016, respectively. The annual level was tested at the Feb. 8 low. Investors looking to reduce holdings should consider selling strength to $108.05, which is a key level on technical charts until the end of September.